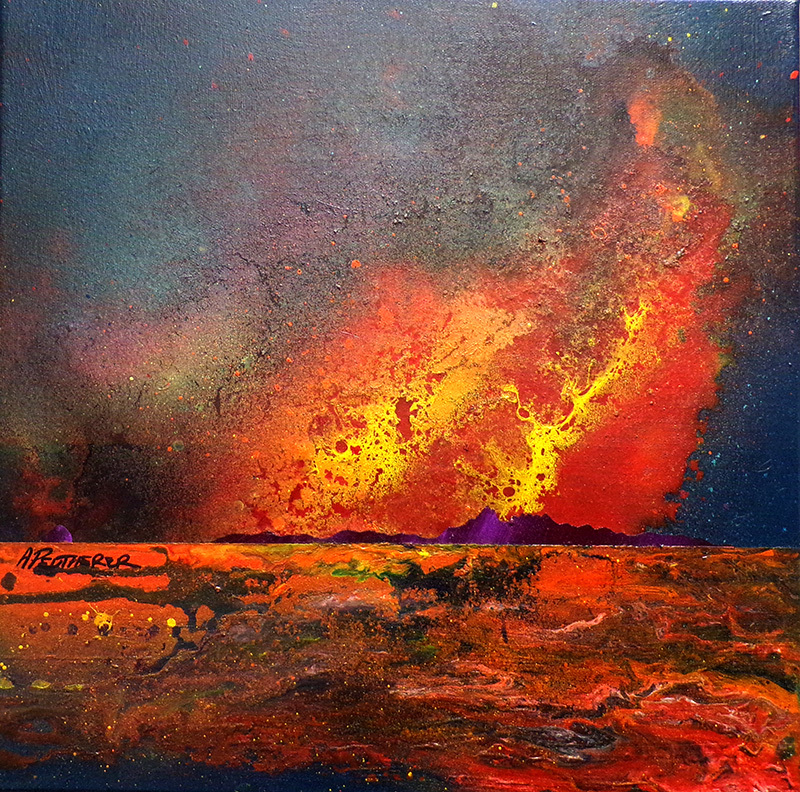 Original painting & prints of Arran, known as The Sleeping Warrior from the Ayrshire coast. An original abstract, atmospheric seascape painting of The Isle of Arran depicting the Sleeping Warrior from the Ayrshire coast, Scotland. 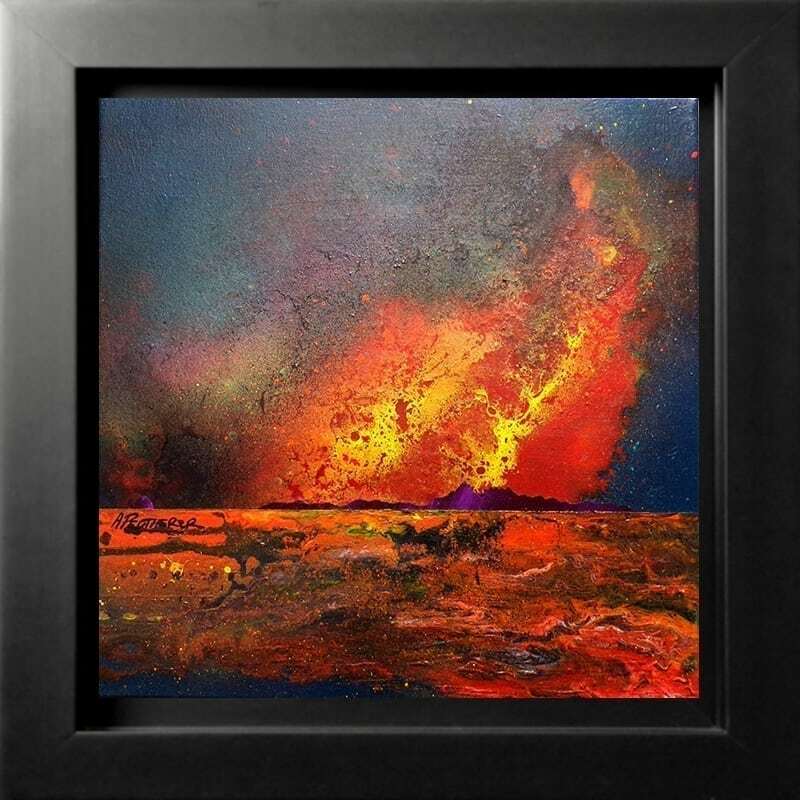 A dramatic mix of mediums are blended layered and splattered over the canvas to produce a very atmospheric painting depicting the ever changing wild weather. The weather on Arran is constantly effected by fronts sweeping across Scotland’s islands from The Atlantic. I love to combine & layer different types of paint & application of medium, creating a unique style of atmospheric painting. The resulting painting is hopefully full of vibrant colour and drama. Original mixed media painting in acrylic paint, spray paint, oil paint & acrylic ink on canvas. Titled & signed prints are available to buy including the original painting if listed. Sizes, prices & formats below, alternative sizes available on request. Paintings & prints of Arran – Sleeping Warrior Dusk, Ayrshire, Scotland. Arran, Scotland. Original painting and prints.